From now, men will take more seriously the idea that help is at hand, that they are not alone, not without aid in their grief and helplessness. Recent events have brought again to humanity the hope that, at the point of their greatest need, when they had all but relinquished hope of succour, somehow their prayers would be answered and their pain assuaged. So potent has been the response to the essence of Maitreya’s words, however quietly or obliquely uttered, that many already feel heartened and reassured that all will be well, that the future for men will be just and kind, even better than they dared to hope. Many are already beginning to doubt that this man is really ‘one of us’, but is someone sent from above to answer their call for help, and to ease their burden. Many, doubtless, find His words unhelpful and obstructive to their desires, but many more, by far, sense the simple truth of His ideas, and await eagerly their fruition. Thus, quietly and steadily does Maitreya aid the plight of men. Some have already recognized Him and pray to Him. Others are glad to hear aloud the answers to their many problems and await the opportunity to play a part in their solution. Thus do the simple words of Maitreya echo through the world. Thus do they awaken in men the hope of renewal. Where enough men are so awakened and ready for change Maitreya will increase the tempo and energy of His delivery and galvanize millions to call for action on their own behalf. Men must understand that action must come from themselves, else nothing new can happen. Where men realize this they will act, spontaneously and with hearts ablaze with hope. So will it be, and so will men fulfil their destiny and create the better framework for the new age which opens before them. Maitreya is at the beginning only of His task to guide men into right relationship; but already He finds that His words encourage, and soon will galvanize, millions to act and claim their destiny, not through revolution but through revelation of their own divinity. During Benjamin Creme’s Paris lecture trip, on Friday 26 March 2010, he was given, via mental telepathy, a new message from Maitreya, the World Teacher. that is why I have come. that which has been destined from the beginning of this world. All depends on you: you have to take the steps which make this possible. We have to see ourselves as One, brothers and sisters, and work together for the good of all. and for whom I work every moment of My Life. My Blessing is upon you. Accept My Blessing, and live simply and with love. These qualities are close to My Heart. A. Maitreya has given 11 interviews, as we go to press. Q. Were all the interviews on the same channel? Q. Do the interviews take place at the same time of day each time? Q. Thank you for the inspiring news about Maitreya’s TV interviews in America. Is it correct that you advise that anyone who thinks they have seen Maitreya’s interviews on US television should keep their ideas entirely to themselves? Are there any exceptions to this? A. People can say they have seen Him but not more than that. They should not say anything that cuts across His being incognito. Nor should they say anything which leads people to knowing who or on which TV programme He appears. Q. What are you going to do to stop the silliness on the Stephen Colbert show in the US? Are you going to realize that Raj Patel is not Maitreya or are you going to tell the world that he is Maitreya? This nonsense has got to stop. Maitreya is not here yet and won’t be for 20 years or so. Please help us to stop this silliness and let the world know that He has not come yet. Thanks. A. For the last 35 years, at Maitreya’s request, I have been preparing what He called His way – that is preparing humanity for His emergence into the everyday world with a group of Masters, His disciples. This has involved worldwide lectures, writing many books, and editing Share International magazine. With a group of co-workers, together forming Share International, we have sought to make known the presence and emergence of Maitreya the World Teacher since July 1977, when He came from His retreat in the high Himalayas to the Asian community of London, UK, as a fully grown, adult man. He sees London as His point of focus in the modern world. On 12 December 2008 Share International revealed to the world’s media that a ‘star-like luminary’ would appear in the skies and be seen throughout the world, and that it was a sign, a herald of Maitreya’s first appearance on US television in the very near future. Since then that ‘star’ has been seen worldwide. At a lecture in London on 14 January 2010, I announced that Maitreya’s first appearance on US television had indeed taken place. He has now taken part in 11 such appearances, which are continuing. He appears incognito, as one of us, an ordinary man, so that when people respond to Him they do so because they want for the world what He advocates for the world, and not because of His spiritual status. I have never pointed to a person and called him Maitreya. The ‘silly nonsense’ story to which you refer has absolutely nothing to do with me or anyone associated with me in Share International. As I told Scott James, the journalist who started this story in a New York Times article, I had never heard of Raj Patel. I have never met him and know only what others are saying about him. As I said to Mr James, it is not my work to say that anyone is or is not Maitreya, nor will I do so until Maitreya acknowledges His true identity on the Day of Declaration. I also told Mr James that Mr Patel (who himself denies being Maitreya) could not be Maitreya. Apparently he was only a child of four when Maitreya arrived in London in July 1977 as a fully adult man. I have met literally dozens of people who believe that they are Maitreya, the World Teacher. It is ‘in the air’ so naturally, it arises in some people’s minds, as a result of the efforts of Share International to raise the expectancy of people for the coming of the World Teacher, that they could be ‘the One’. So, I am sorry, but there is no way I can accept your request for me to deny my own knowledge and experience. Be assured you will see Maitreya soon whether you recognize Him or not. He is very much here and hard at work to enlighten humanity. Q. On 31 March 2010, when I went outside for a coffee and centering before work, I saw a star. As I noticed it, I wondered “is this a sign?” and it burst into a diamond-shaped bright burn. At first I wondered if this was real, then it got larger, then smaller, then larger again and went left and right, and seemed to be playing with me! When I knew I’d have to go and get ready the light went smaller again, then zoomed off with little sparks behind it. I smiled, and thought “how beautiful”. Was this the star? A. Yes, indeed. This is a beautiful description of how the ‘star’ behaves. Q. (1) Are coalition governments the way forward for many political systems which suffer from oppositional conflictual party politics? (2) Is it a form of consensus government which we may see more of in future? Q. I have a 12 year old son (who is autistic), an old soul, he can be very wise. I told him about Maitreya. He has a certain amount of innocence, an open mind in his belief. He asked me, would Maitreya appear if he prayed. I told him, everything was pos­sible. Have you heard whether Maitreya has ever appeared to children? A. Yes, we have several letters from parents whose children were ‘visited’ by Maitreya. Q. I honestly wish I could believe you, and as a matter of fact, you did have me fooled for a while. My wife and I always helped those in need, many of whom were complete strangers, and still would if circumstances hadn’t changed drastically for us, and now at our ages of almost sixty, will soon be out on the streets ourselves. If there truly was a saviour or God, why all the wars and poverty? We used to support a couple of those television preachers, then when I wrote to ask for some desperately needed help, none had the courtesy to reply. Anyway I just had to get my two cents in. A. I am sorry indeed about your change in circumstances as you so mildly put it, especially as I have been predicting this economic collapse, of which you are a victim, for years. I certainly hope that your situation improves very quickly. I would like to point out that I have never talked of Maitreya as a God or saviour. Our problems are made by ourselves from our greed and selfishness (not in your case), and from what Maitreya sees as the root of all evil: our complacency and sense of separation. No one can “save” us but ourselves, through a growing understanding that we are brothers and sisters of one world, and by sharing the world’s resources, creating justice and so achieving peace. Q. Is it reasonable for Argentina to pay its debt with the IMF, World Bank and other international financial institutions, from the reserves of the Argentine Central Bank? If not, what is the correct way to pay? As ever, very thankful for your consideration in answering my questions. A. It is up to the Argentinean people themselves to find a way to pay their debts. It is not for me to say. Q. It is said in my country, Japan, that CO2 emissions trading is an excellent idea. Logically it sounds smart but I feel something is wrong with that idea. The more I hear some politicians and economists valuing it and emphasizing its economic effects, the more I smell a rat. I doubt small businesses or poor countries can afford to buy their emission quota. They would have to get in debt for it or simply ignore their quota. Isn’t the system another means of making money for money men? Isn’t this new so-called excellent system made again for benefits of rich countries and persons? Could you please shed light on the pitfalls of the emissions trading system? A. You have just said it. It is iniquitous. On 12 April 2010 an article appeared in The Guardian, UK, by author and economist Raj Patel, entitled ‘We don’t need a Messiah (and anyway it isn’t me)’. Following Benjamin Creme’s announcement on 14 January 2010 that Maitreya had given His first interview, speculation grew on YouTube and led to Raj Patel being mistakenly identified as Maitreya, by people with no connection to Share International. Newspapers and television shows around the world took up the story. The following is an edited version of Benjamin Creme’s response. I would like to make a few points in response to Raj Patel’s article on 12 April 2010 concerning Maitreya, Share International and myself. I, and those involved with me in Share International, have absolutely nothing to do with Dr Patel being named as Maitreya, which is the result of coincidences and circumstances beyond the control of any of us. I regret the inconvenience it has caused. I agree wholeheartedly with Raj Patel’s concern for the poor of the world and his desire for a fairer society, and I have been advocating these ideas for 35 years. Raj Patel appears to hold the view that I am suggesting the presence of a ‘Messiah’ figure who comes to make all things bright and beautiful for a grateful and supine world. Nothing could be further from the truth. Maitreya himself is at pains to clarify His position that every stone and brick of the new civilization must be put in place by humanity itself. We have free will, which Maitreya holds as sacrosanct and will never infringe. To my mind Dr Patel leaves out a huge and irreplaceable dimension. Why, do we think, that over the centuries, people like Confucius, Krishna, the Buddha, Jesus and Mohammed have come into humanity’s midst? Over and over, the doctrine of a World Teacher has manifested – a Teacher has come to help humanity in times of crisis. This is not a mystical fairytale but a profound part of the history of the world. The role of World Teacher is now held by Maitreya; the previous holder of the office was the Buddha. This is an office in our Spiritual Hierarchy of Masters, who are gradually returning to the everyday world where once they lived as men. Above all, Maitreya’s presence now is motivated by the call from humanity, both conscious and unconscious, for help. I am not talking about religion. Maitreya does not come as a religious teacher but as a spiritual teacher in the broadest sense. About religion Maitreya has said, “Religion is like a ladder, it can help you to get onto the roof but once you’re on the roof you don’t need the ladder, you can give it to somebody else.” Maitreya is really speaking about freedom: freedom for each of us to be ourself, truly and utterly, and He has come to show humanity how to attain this freedom from indoctrination and conditioning. The world is already awakening and growing in understanding through the energies and ideas released by the man who Dr Patel thinks is irrelevant to our needs. As yet incognito, Maitreya has already been talking to millions via US television, and His ideas and energies are inspiring many with new hope and resolve to change their world for the better. I am not a betting man but I would wager that Raj Patel would be among the first to respond to Maitreya’s teaching. Recently an x-ray at the opticians showed a large macular hole in my right eye. A consultant at the hospital verified this diagnosis and referred me for a possible operation, but wanted a further x-ray. Clutching a small print of Maitreya’s ‘hand’, imagine my surprise and delight when the x-ray showed a spontaneous healing of the macular hole! (1) Was Maitreya’s ‘hand’ responsible for this wonderful present? (2) Am I imagining a new sense of joy in the world? On Saturday 26 March 2010 I went to St Albans Cathedral where I often go on a Sunday to pray and meditate in the quiet annex where many people’s prayers add to the spiritual energies of the place. But this time I went on Saturday for it was the birthday of my beloved daughter Lesley who died three months ago. Afterwards, walking down the hill from the Cathedral to my car I stopped to buy a planter full of flowers for my other daughter Francine, foolishly imagining I could carry it all the way to the car park. I was beginning to struggle when a man and woman with a baby in a pushchair approached me. “May I carry that for you? It looks very heavy,” said the man. “Thank you, I can manage,” I replied, but they followed me and soon he said: “I think you had better let me have that.” This time I accepted gratefully. The woman had a smiley face and chatted to me as we went down the hill, and I found myself telling her about my daughter, something I would never normally tell a perfect stranger. At the bottom of the hill there is a long walk to the car park. I said: “I am alright now,” but the man said: “I don’t think so,” and proceeded to carry it along the path until we finally reached the car park. I opened the boot and he put the planter into the boot of the car for me. “I can’t thank you enough for your kindness!” I said. The woman said something and I can’t remember her words except that they were wonderful. She opened her arms very wide and enveloped me in a hug and the man who had been silent all the while shook my hand. In the car I began to wonder why I had met such lovely people on this especially sad day, and that although they looked just like any other couple with a pushchair they seemed to have a deep knowledge of the agony of grief I have gone through in these past three months, which I felt no friend however sympathetic can understand completely. I looked around but the couple had disappeared. I began to wonder if the silent man was Maitreya and the loving woman the Master Jesus? B.T., St Albans, England, UK. If I’m honest with you, I’d never heard of Share International before the Raj Patel incident. But I was surprised I’d never heard of you before. I posted a comment under Raj Patel’s Colbert interview (on Comedy Central’s Colbert Report website) under ‘Unemployed Accountant’. 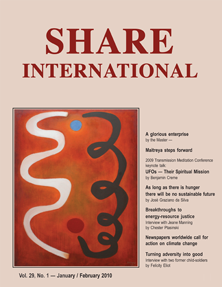 I can understand Share International’s frustration with the New York Times but I can imagine that it’s had some positive effects in the way of publicity for Share International. Anyone who is ready to understand the position from which Share International is speaking will have begun the process of at least reassessing once possibly firmly held beliefs. Share International’s message will surely resonate with these people, either now or at some later date when they are ready. It was only after writing my comment I realized how aligned my own beliefs were with that of Share International and wanted to get in touch and offer to help in some way, however small this might be. Many thanks for what you are doing. In February 2000 I got home after a three-day trip to find that my CD system had come on in my absence. A tape of Sai Baba bhajans was playing loudly. I hadn’t played this tape in ages. The previous time I heard it was when it came on automatically as I switched on the CD system. Do I have a ghost in the machine? We had an interesting experience on 16 March 2010 when we had to see our doctor. While we were in the waiting room, an elderly gentleman with a walker came in, accompanied by his daughter. The man sat across from us and the daughter sat beside Jessie. The man seemed genuinely joyful and began talking to the woman next to him, informing her that he was 97 years old (which he didn’t look at all!). There was something about him that reminded us a bit of Mr Creme! Conversation struck up between the few of us sitting, waiting together and the man and his daughter. He talked in such a jovial, humorous and positive way about things, with references to his talks with God. He had a lovely gesture that he did a few times, turning his hands palm-side up, accompanied by a little smile, as if to say: “Well, that’s how it is.” He seemed to fill the room with great joy. When we came back through the waiting room after seeing the doctor, he was still there. He smiled so sweetly, clasped his hands together towards us and gave us a little bow as we left. It was really quite a wonderful, simple experience of people being so open and happy with each other, and left us wondering if these two people were ‘ordinary people’ or perhaps, Maitreya and the Master Jesus. We’d appreciate it if the Master could tell us, please. Whatever it was, it was a lovely little encounter. R.S. and J.W., Vancouver, Canada. I work in Leipzig and every day we walk through the nearby Johanna-park during our lunchtime break. On 31 March 2010, I discussed the appearance of the ‘star’ and Maitreya’s role in the modern world. When we entered the park I saw a middle-aged man with long curly black hair riding an old bicycle with a blue battery-lamp taped on it. I never saw such a funny construction before and when we left the park he crossed our way again. He didn’t say anything to us, but I guess there might have been a reason for crossing our way. Usually I don’t see anybody like him in public here in Leipzig. Could you please tell me if we simply met an unusual man or was it Maitreya? In October 2009 at about 5.30am and looked out of the window to the east, I saw a large object bigger than a star, intensely bright orange. By six in the morning it moved further away and changed colour, then disappeared at 6.30am. This is not the first time I have seen this object from the window. I’ve been seeing it for months. Is it the announced ‘star’? On 14 February 2010, Valentine’s Day, at around 8pm, I was at a club called Castle Tintagel in Tokyo where we had been enjoying a party since the afternoon. 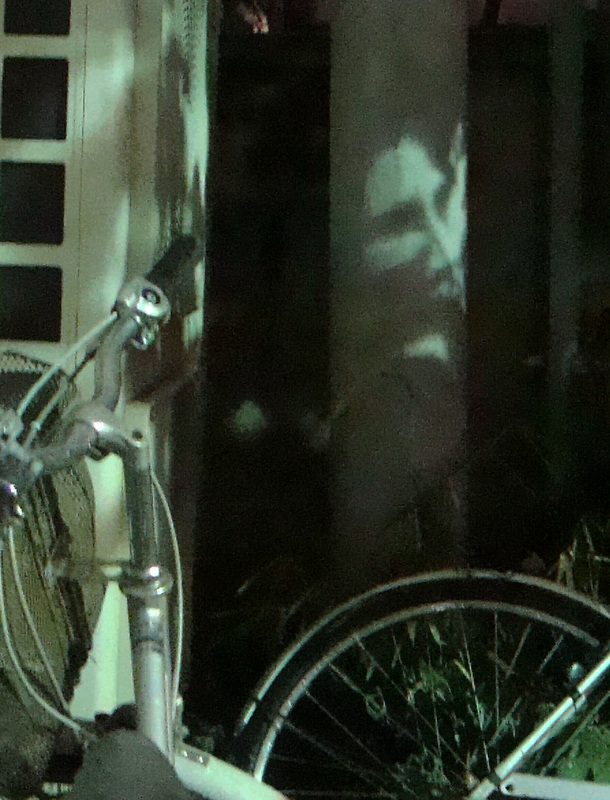 As I was leaving, I noticed a face of a person projected on a utility pole positioned behind the bicycles. The streetlight was shining on the pole through the leaves of a tree, and the shadow of the leaves was forming a silhouette that looked just like a face of a person. However, it wasn’t just a silhouette. It looked as if it was a black and white photo or charcoal sketch and had delicate nuances to make it look three-dimensional. I could even see the shape of his forehead. It stood out from the background. The face was of a man, clear-cut and fine-featured with a long, straight nose. He wasn’t young, and his expression gave a sense of dignity and deep concern. Several other people saw it, and they were surprised, too. A couple of people were scared saying it might be a ghost, but I said to them: “Ghosts wouldn’t have such an atmosphere of dignity and beauty. This is not a bad thing. No need to worry.” Then one man replied: “Indeed. If this person actually exists, he must be quite a man.” A woman who hurt her knee at the party’s sword tournament said that the pain was gone. Before I used to have many unresolved worries but since seeing the face I have been feeling more confident and hopeful. Was the face manifested by one of the Masters? I found this apple on the ground under my tree in 2009. 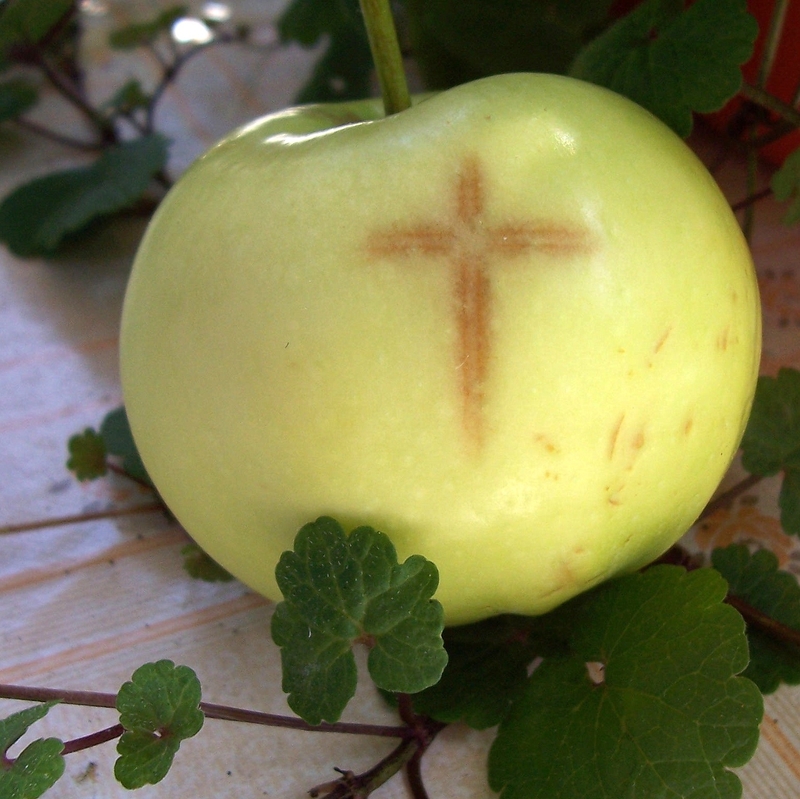 The photograph shows a nearly perfect image of a cross on the apple. Please can your Master say if this was a miracle or just a fluke? A new time is in the making – of justice, freedom and peace. In this coming time the peoples of all the nations will see fulfilled their dreams and hopes of a better life: of meaning and purpose, of beauty and understanding, of right relationship and love. Each day will bring a new discovery, inner and outer, each hour an opportunity to serve. Thus will it be, and thus will each man, woman and child glorify the divine in all of us, and show in all its variety the many-sided beauty of God. When Maitreya emerges, He will seek to canalize the aspiration of countless millions who sense these truths but cannot give them voice. In Him will they find a spokesman, eloquent and severe as circumstances require; through Him will they find their needs made known, the needs of all for a just and peaceful world. Thus shall I speak; so shall be My Appeal; and when mankind has accepted this Law, I shall declare Myself. Many there are now who know this to be true, who desire to share, who long for brotherhood, yet act not. Nothing happens by itself. Man must act and implement his will. Today, that will is the Will, also, of God. Therefore, the outcome is assured. If we are serious as disciples we have to take a hand in our own evolution. The way we do that is to aspire. Aspiration is the force driving us onwards and upwards. It is really coming to us from the soul. Soul consciousness, the Christ principle, is the principle of aspiration. It is that very principle which brought the animals, then aquatic, out of the seas on to dry land, created from these primitive reptilian types the mammals, and from mammals, the human kingdom. In that process the initiating factor to a higher form, in every case, has been through aspiration. Aspiration results from the downflow of energy from the soul, because it is the soul in all forms which incarnates. The energy, the consciousness of the soul, poured down into the instrument – man, mammal or aquatic reptile – brings about a response. With us it is immediate, 18 ½ million years. In the animal kingdom it takes countless millions of years. Gradually, over millions of years, aspiration grows, responding to the call, the consciousness of the soul, which is pointing to something higher. You cannot say, of course, that the soul impresses on the sluggish animal creeping out of the sea – alligator or whatever – a vision of divinity. For the alligator, the vision of divinity is a fat person swimming. My Coming portends change; likewise, grief at the loss of the old structures. But, My friends, the old bottles must be broken – the new wine deserves better. My friends, My brothers, I am near you now. I see above and around you your aspiration for Love and Joy. I know this to be widespread in mankind; this makes possible My Return. Let Me unveil for you your divine inheritance. Let Me show you the wonders of God which yet await you. Allow Me to take you simply by the hand and lead you to the Forest of Love, the Glade of Peace, the River of Truth. Take My hand, My friends, and know this to be yours, now. The very nature of life is change; it is essential. There is nothing more real in the whole of cosmos than change. Change happens and you have no control over it except in very minor ways in your own mind. The change that takes place as life finds new forms, new modes of expression, is outside your control. The first fish that came out of the sea and took up living on dry land experienced a change which it never contemplated. There is a mechanism we call aspiration, which from its very nature drove the fish out of the sea onto the land. It aspired to a different condition. The nature of desire is glamour, but at the same time it is in every single rock and stone, in matter itself. There is no such thing as dead matter; all matter is conscious. It is the consciousness of the atom, the desire principle inherent in every atom in the universe, that drove the fish out of the sea and onto dry land, to become a mammal and eventually a human being. My brothers and sisters, take within you That which I am, and prepare to see a New Light. Hold within you That which I give, and know the meaning of Truth. Release within you That which you eternally are, and become Gods. I am among you now. I see your dreams of Trust and Love. I feel your aspiration and hopes. I shall take these to My heart and accomplish them for you. I am your Mentor. I am your highest wish. I am your clearest light. I am your heart’s love. I shall take you to that Blessed Country which I call Love. I shall show you God dwelling therein, and evoke from you that divinity. Hold fast to your Truth. Hold fast to your Light. Hold fast, My friends, My brothers, to your Love. Manifest that Love and follow Me. 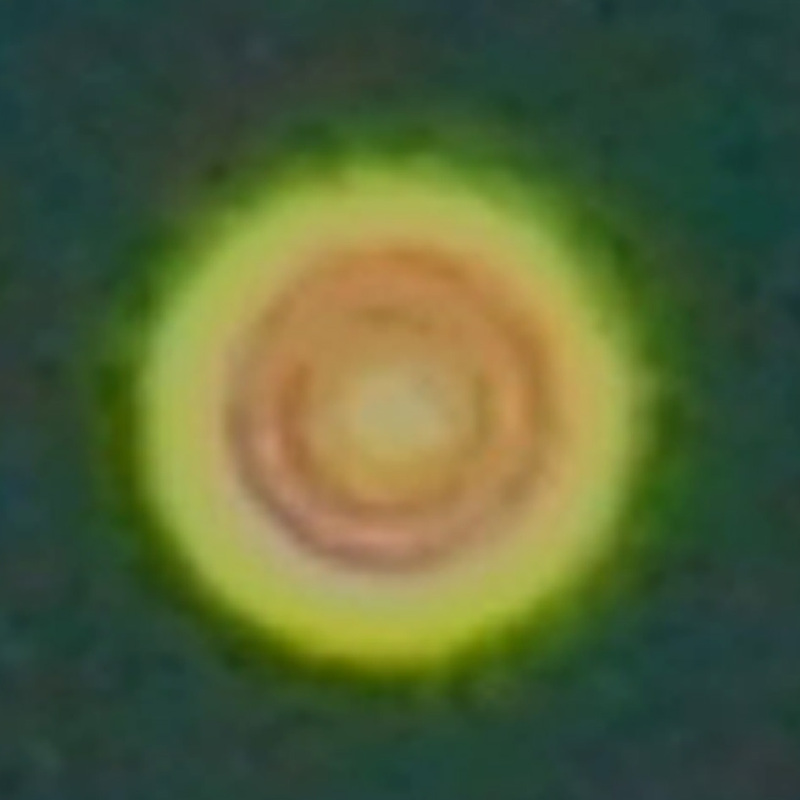 On 12 December 2008 Share International distributed a news release announcing that in the very near future a large, bright star would appear in the sky visible throughout the world, night and day, heralding the imminent appearance of Maitreya in His first interview on a major US television programme. Since then sightings of the star have been reported all over the world and hundreds of sightings have been sent to Share International. We include a selection of the latest reports from the media, Share International readers, and sightings from YouTube. All the photographs show genuine sightings confirmed by Benjamin Creme’s Master to be the ‘star-like luminary’ heralding Maitreya’s emergence. I have filmed what I think is the ‘star’, three times in the past two weeks. The first sighting was in New York on 31 March 2010 while I was visiting my brother in Stormville. I walked outside to retrieve my camera and saw a very bright celestial object shining in the sky, even though it was not yet dark. Even with the naked eye I could see it flashing and changing colours. 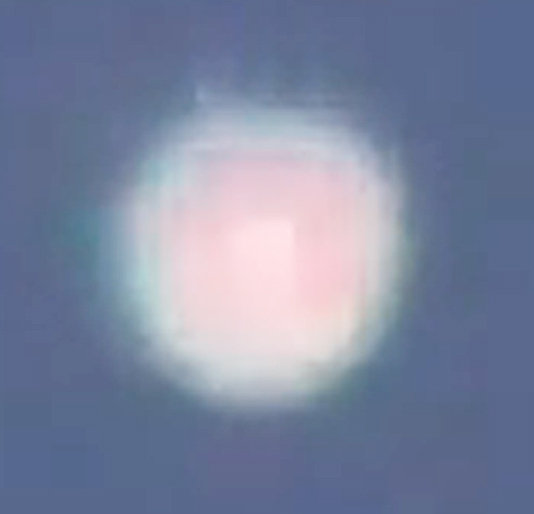 I pulled out my camcorder with a 70x zoom and began to zoom in and record. The object changed colours, size and shape and danced around, despite my best attempts to keep the camera still! I felt real joy while I was filming, which lasted about five minutes. At one point the object became really big and almost transparent! I was truly amazed, because I had set the intention to see and record the ‘star’ while I was visiting New York! The second sightings were in Pinole Valley, California, on 7 and 8 April. Again, the ‘star’ changed size, shape and colour as well as moving rapidly around, changing from a hexagon to a circle and back again. The third sighting was over Berkeley, California. On 9 April 2010 when I headed to Transmission Meditation and parked my car I saw what looked like the ‘star’ in the western sky. It had many of the same characteristics as the previous sightings. Were these objects in fact the miracle ‘star’? In the 1970s my Aunty Liz and Uncle Pete were on a beach in Scotland. A low flat disk appeared over a beach where they were walking and followed them a little way. Pete said it was a bit scary as there was nowhere to hide, but the disk disappeared. I wonder what it was. On 22 October 2009 in Zurich on my way home at around 7.30pm I ‘followed’ a blinking star (the blinking didn’t seem regular as from an airplane), but when I stood still it seemed to stand still as well. After a few minutes I couldn’t see it anymore. Was it the ‘star’? Hundreds of people have been flocking to a small house in the town of Watsonville, California, to see a cross of light which has appeared since mid-March, 2010. When light is on behind the garage window of the single storey house a cross of bright light is seen that shines into the covered carport. At night the cross is projected onto the floor and changes colour and shape depending on the type of light behind it. The ‘star’ photographed on Easter Sunday, 4 April 2010, at 8.30pm, over Hullbridge, Essex, UK, by C. E.
Now that is a statement that should make all of us re-think the way we live, shop and eat. And how much we waste. I first heard Tristram Stuart talking to Sir David Frost in a television interview. In the brief exchange Stuart, author of a challenging book, Waste: Uncovering the Global Food Scandal, managed to throw down the gauntlet to consumers in the over-indulgent industrialized nations and manufacturers and retailers alike. Tristram Stuart, 33 years old, wrote The Bloodless Revolution: Radical Vegetarians and the Discovery of India and is a regular contributor to newspapers, radio and television. He was also responsible for the Christmas-time project (December 2009) ‘Feeding the 5,000’ in Trafalgar Square, London, which provided thousands of people with a generous meal from food going to waste. Stuart is a tireless and meticulous researcher; not satisfied with data alone, he tests all his information and his ideas on himself. From his mid-teens he has lived on food that would otherwise go to waste. Share International: I’d like to start with the basics, if I may. How much food waste is there in the world? And are you talking about Western countries only? Tristram Stuart: I researched waste in both industrialized and poor countries; there is waste in both. It is a huge problem in the West. In the West it is generally a question of our negligence towards food. In developing countries the problems of waste are caused by lack – a lack of simple facilities, for example, adequate refrigeration, or basic agricultural infrastructure, fruit crates, pasteurization and so on, which would allow the rapid transport of fresh food to markets before it spoils. There are easy solutions to both those problems. SI: Would you say that in the West it is a question of attitude? TS: Yes. That is a major issue. In the West, in our homes, we waste 25 per cent of what we buy in the United Kingdom. It would be fairly easy to be more aware of how we shop and to start buying only what we need. SI: Is waste deliberately built into our system? I’m talking about supermarkets, for example. TS: In some cases, yes, absolutely. To answer fully we’d need to go right through the food chain. Retailers aren’t doing enough to avoid waste, certainly. Let’s look at what happens on our farms. 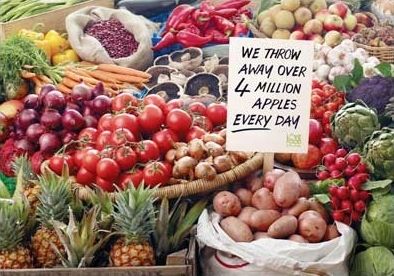 We waste food for cosmetic reasons – fruit and vegetables that don’t look regular and perfect are rejected. SI: Do you mean retail outlets won’t accept the less than perfect banana or oddly shaped potatoes? TS: Exactly. Imported fruit that is so-called ‘ugly’ food is rejected at our ports or in the countries where the fruit and vegetables are grown. These cosmetic standards are totally unnecessary and there’s no reason why we shouldn’t see more ugly food or ‘wonky’ food on our supermarket shelves. If you look at what happens in our slaughter houses, huge amounts of meat are wasted. Some foods are simply no longer in use – offal, for example, and various others parts of the animal are no longer used. Yet they used to be a normal part of our diet in the past. During my research I visited a well-known UK supermarket chain’s production plant where sandwiches are made. There I noticed that four slices of bread are wasted per loaf. SI: Was it the crusts and was it for reasons of hygiene? TS: No, not at all. The crust and the first slice. There is a demand that each slice of bread looks like the others. They must all look exactly the same. This means that 17 per cent of each loaf of bread is wasted. If you think of that in terms of the land used, the water, the energy, the fossil fuels etc used to grow that wheat for that bread for no good purpose. That’s 17 per cent of the land and all the resources put into producing it. So, to go back to your question – yes, in some sense waste is quite definitely built into our food systems. SI: You mentioned that there are solutions to the problem of waste? TS: Yes, there are solutions and some are fairly simple. And there is evidence that the situation is beginning to change. Some retailers are starting to stock more wonky food. It’s not unprofitable to stock and sell oddly shaped fruit and vegetables. There is movement towards change. SI: Is that mainly in the European Union? Is it a general change? TS: Different countries have different ways of dealing with this issue. The problem isn’t as bad in some countries. In Germany, for example, you can more easily buy sacks of potatoes of all sorts of shapes and sizes than you can in the UK. However, the fact that some countries can do this makes it obvious that we could all do more to change the way we do things. To get back to the question of how much waste there is, the problem is that there hasn’t been enough research into waste. I use two approaches; first of all empirical – so you can see how much food gets wasted at every step in the chain. That means looking into supermarket bins, finding out how much of a crop gets left in a field. But there’s another set of evidence which is what are called food balance sheets. And there you can find out how much food is present in any one country both through production but also after exports/imports have been taken off. Then you can compare the total food supply with food intake, and the disparity between food supply and consumption gives you an idea of what is wasted. Rich countries waste between 30 per cent and 50 per cent. In the USA it is 50 per cent; in Europe it is about a third. SI: Sorry, that’s so shocking. Just to be clear: food waste in rich countries is as high as between a third and a half? TS: Yes. In America it is about half and in European countries it varies between a third and a half. Rich countries waste more. But if you look at the total of all food produced – that is, the entire world food supply – then we find that one-third of all food is wasted. I’ve plotted this evidence and you’ll find it at the back of my book. TS: Yes. Of course, in a world of infinite resources that might be fine. And in the past, it may have been normal to cultivate or hunt and gather food for everyday consumption and keep a surplus which tided you over in times of scarcity. But now we horde and waste more food than we can use. Now, however, I would say that one of the biggest environmental problems is the extension of the agricultural frontier. We are paying Brazilians to chop down the Amazon to grow more food to export to rich countries where it is wasted. The issue of global warming calculated that roughly 10 per cent of all greenhouse gas emissions come from food that is being wasted. In fact that figure doesn’t even include emissions from deforestation. If you do include it the figures really soar to extraordinary levels. I calculated what the emissions are for meat production in Europe and North America and if you include deforestation in that, the number can double or increase by a couple hundred times. Also, you’ve got to look at the total world food supply: we can produce a finite amount of food in any one year. If we in the Western world are importing food from all over the world and then wasting half of it we are depleting the world’s food supply. All countries buy from the same international market sources. 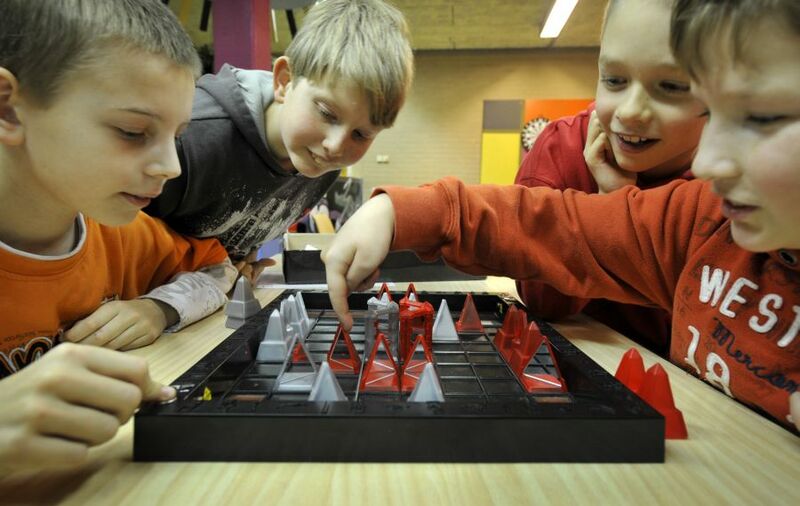 Some 2.5 per cent of children in the Netherlands are highly gifted. Since the current education system does not take their capacities into account, many are bored at school. The result is an unhappy list of learning difficulties, behavioural disturbances and socio-emotional problems. Leonardo schools, where the enrolment prerequisite is an IQ of 130 or higher, offer these children tuition that caters for their aptitude and encourages their development, explains founder and initiator Jan Hendrickx. Andrea Bistrich interviewed him for Share International. Share International: Are the children of today cleverer, more intelligent – possibly even wiser? Jan Hendrickx: I believe that, generally, children today are actually more intelligent. Due to the manifold media and the pictures that they convey, the children’s world has expanded. 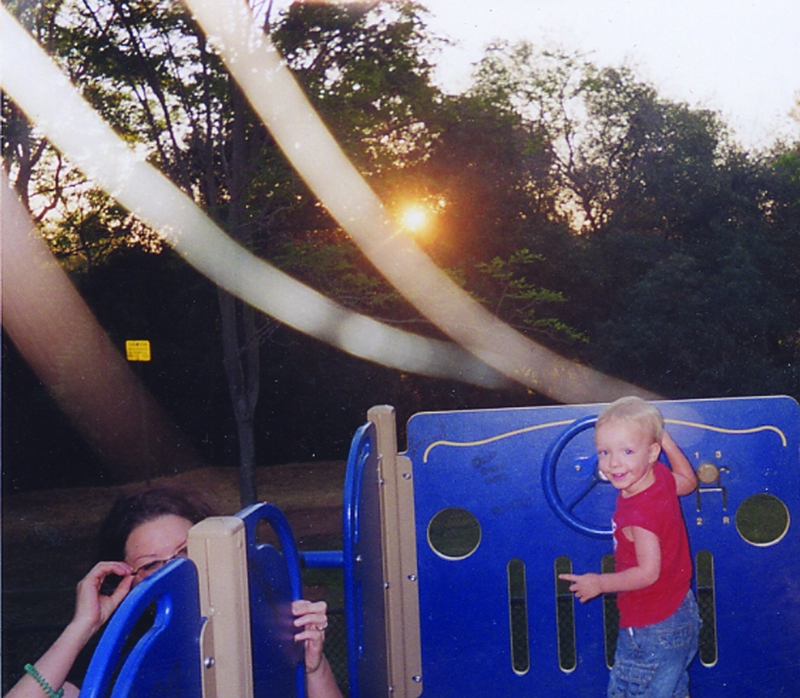 Thinking back to my own childhood, we were much less aware of events outside our immediate surroundings. This is different today. Children receive more stimulus and impressions and hence think and form opinions about certain things much sooner than was the case 20, 30 years ago. SI: You yourself were involved in the education system for a long time and as you were about to retire you started to develop an educational concept for highly gifted children. What prompted you to do so? JH: I was a school principal for 33 years, and when I retired in 2005 I found that I still had a task to fulfil. A second-form teacher once asked me for advice, in my capacity as school principal and teacher. She had received an unusual piece of dictation from Clemens – a boy who otherwise had the highest grades. In this dictation there were suddenly mistakes in each of the ten sentences. The strange thing was that the incorrect words were written in capital letters. I decided to speak to Clemens’s parents, and asked for permission to do a spelling test with him after school. This test, with a sequence of 50 words to be tested, had been developed for the first to the sixth forms. It began with simple words like ‘cat’ and ‘moon’ and ended with words like ‘electrician’. Of the 50 words Clemens spelt 48 correctly. In the second form, at five years of age, Clemens had already attained a level that children were expected to have in the sixth form at the end of elementary school. At the time, my initial thought was: What must it be like for a child to have to learn all day long in school, something that he/she already knows? This thought stayed with me and over the years developed into actual teaching concepts for highly talented children. SI: When can one talk of the highly gifted? JH: The American psychologist, Joseph S. Renzulli, a leading researcher in the field of promotion of the gifted, described in his Three-Ring Model a combination of intelligence, creativity and motivation, which together make for highly gifted: a very high intelligence – with an intelligence quota over 130; creative thinking – a criteria that differentiates the highly gifted from the average; and motivation, which, amongst others, expresses itself as goal oriented, steadfastness, and stamina in completing tasks by sticking at a task or question as long as it takes to find a satisfactory solution. The problem is that these three criteria do not find expression within normal tuition. Neither the exceptional talents nor the intelligence of these children are addressed; instead they are confronted with content that is five to six years beneath their level. They are not required to think creatively since during teaching the emphasis is placed on the assimilation of information, storing it in memory so as later to be able to reproduce it when needed. With time their motivation and steadfastness fades since they do not need to make any effort in class. SI: How can gifted intelligence be assessed? JH: There are the so-called intelligence tests that register general and specific intellectual capacity. If the intelligence quota or IQ is above 130 the chance is high that the child is gifted. There is also a list of attributes that present themselves at an early age which indicate a gifted child. For example, some highly gifted children jump the crawling stage; they suddenly start walking without having crawled. A further characteristic is starting to talk at a very early age or else to hold eye contact at an early age: some babies already hold eye contact at six or eight weeks. The use of difficult words at an early age can indicate exceptional intelligence: especially the use of abstract words and ideas like ‘trust’ or ‘responsibility’. Often these children are experienced as ‘different’ or ‘peculiar’ by other children of the same age since they can reflect and verbalize associations that do not engage their contemporaries. They also ask questions of such depth that are absolutely unusual for children of this age. SI: You speak here of their intellectual and cognitive abilities, but what about the emotional development of these children? JH: At the age of four their emotional and social development are of children of four years – even if they have an intelligence corresponding to children between eight and ten. This also makes it difficult for them: on the one hand they are cognitively way ahead of others of the same age and can often better relate to older children and, at the same time, they have the emotional and social need to be with children their own age. I want to help these children, using the Leonardo concept, to solve the problems and difficulties with which they are confronted due to their specific development. SI: You have associated the name of your teaching concept with Leonardo da Vinci. Why? JH: In 2005 I organized a series of projects, in the region of Venlo, for highly gifted children, which I named the ‘Leonardo Project’. Leonardo da Vinci was the most versatile genius in history. He was free from an early age to explore his environment without any hindrances, under guidance of his uncle, Francesco, who regularly accompanied him in order to show him things of interest and who, by skilful questioning, encouraged the natural curiosity of his nephew. Leonardo was an ‘all-round talent’: he was painter, sculptor, architect, anatomist, mechanic, engineer, natural philosopher and much more. This is also my ideal: not to limit people to one area of knowledge but to encourage in them a broad inclusive development. With this in mind I launched an art project in which children could engage with modern art for half a year – during tuition times. On a specific day of the week they went to an art museum instead of school. There they heard theories about Pop Art, Cobra, Expressionism, Surrealism and many other streams of modern art and they painted and drew sketches relating to specific schools. There they also learned how a museum functions and how to organize an art exhibition; as a final project they were to present their works in a joint exhibition. Part of the project included visiting artists and interviewing them about their art – why they paint, how their works were developed, what ideas they had, etc. Finally, the children visited galleries and learned how prices for paintings were arrived at. In total a very comprehensive and practical project. A further example is a literature project in which 16 children visited a public library each Wednesday for one year during their tuition time. In this time the children had the opportunity to write a book themselves. Initially we started with a series of workshops with renowned authors of children’s books. The authors explained how and why they became writers and what ideas they had while writing. Some children who could draw well then illustrated the books. At the time I had acquired a printer as a sponsor who printed all the books at the end of the project – each child received 65 copies of the book they themselves had written or illustrated. The children and their parents were thrilled. There were children who said that they had only survived the week at school because of this one day’s activities. At the time, I thought that one should offer children this kind of tuition the whole week. That was my eye opener: we are only used to observing children within an existing method and to trying to integrate them into existing systems. But when children are very different from the average we cannot force the child into the current tuition system; we must adapt the method or the system to suit the child. This is what I did with the Leonardo concept. When I started, I tried to assess what kind of children they are; what abilities and potential they have, and how they learn in order to develop a method of tuition that would suit their needs. An Indian charitable group has provided prosthetics to more than a million amputees throughout the developing world free of charge since 1975. The Bhagwan Mahaveer Viklang Sahayata Samiti organization produces the Jaipur Foot from local inexpensive materials, and fits the prosthetic without cost to victims of war, natural disasters, accidents and anyone else who needs it. Some of the most highly-regarded members of the world scientific community convened in early 2010 at the Royal Society in London to debate the existence of extraterrestrial life. At the beginning of its 350th anniversary year, the Society – the UK’s national academy of science – chose to mount a two-day conference entitled ‘The detection of extra-terrestrial life and the consequences for science and society’. Speakers from NASA, the European Space Agency and the UN Office for Outer Space Affairs, amongst others, presented their theories – ranging from statistical doubt to fear of exploitation of Earth’s resources. Among the subsequent media coverage it was left to the Denver-based online Examiner to point out that the “mainstream scientists” involved seemed “largely unaware of the evidence for an existing extraterrestrial presence on Earth at this time”. Having an optimistic attitude strengthens the immune system, according to the results of a recent study. Researchers in the US state of Kentucky studied 124 first-year law students. Five times during a six-month period the students answered questions about how optimistic they felt about law school. They were then injected with a substance that produces an immune response, resulting in a small bump at the injection site. Two days later, researchers measured the size of the bump. A larger bump in the skin reflects a stronger immune response. Since the early 1980s, astrophysicist, nuclear scientist and NASA consultant Dr Elizabeth Rauscher and her colleagues at the California-based Global Coherence Initiative (CGI) have been using a sensitive magnetic field detector to monitor the planet’s geomagnetic field and its relationship to changes in the ionosphere. But their research went beyond seismic activity. Together with the Institute of HeartMath (IHM), the CGI also found a relationship between the geomagnetic field and a wide range of human activities, including brain and nervous system activity, athletic and memory performance, extrasensory perception sensitivity, and synthesis of nutrients in plants and algae. Within each individual, says CGI, emotional responses affect the body’s relationship to the Earth’s geomagnetic field, creating individual conditions of “coherence or incoherence”. But these effects are also demonstrable on a collective scale: people can synchronize their brain waves with the geomagnetic field – not only ‘tuning in’ to large-scale human emotional reactions to a global event, but also anticipating them. The most extreme example so far of this collective intuition was shown in the global geomagnetic records for the 9/11 attacks on the World Trade Center. The ‘random number’ trace displays a huge spike in the magnetic waves – beginning some 4-5 hours before the attacks. This, says CGI, suggests “a worldwide collective intuition about the impending event”.